Former Barcelona striker Samuel Eto’o embarked on a shocking rant about Pep Guardiola and Lionel Messi during an interview with beIN Sports. The Cameroon striker was once revered as one of Europe’s finest strikers and he reached the peak of his powers during his time at the Camp Nou between 2004 and 2009. The pacey centre-forward won three La Liga crowns and two Champions Leagues at Barca, scoring 131 goals in total for the club, with his crowning season coming in the 2008-2009 campaign. The Blaugrana won the treble that year, with a team starring the likes of Messi, Thierry Henry, Andres Iniesta and Xavi, under the tutelage of Spanish boss Pep Guardiola. 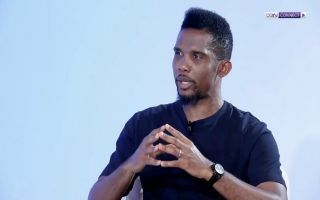 That team is widely considered to be one of the greatest of all-time and in an extraordinary sit down with beIN Sports this week, Eto’o took credit for Barca’s success over Messi during the trophy-laden era. The 38-year-old stated: “Pep has lived his whole life in Barcelona, but in the years I spent in Barca, he didn’t understand the team. He didn’t live the life of our team. Check out a full video of the explosive interview below, via Twitter.